Olav Larsen was born in Stavanger, a small town on the south-west coast of Norway. He currently lives there. His passion for american roots music came at an early age. "My father used to play all kinds of american music" Olav says. "On the one hand he would listen to old records by Hank Williams, Blind Willie McTell, Jimmy Rodgers and Robert Johnson, but on the other hand he also enjoyed the new generation of great songwriters, like Bob Dylan, Neil Young, John Prine, Guy Clark, Steve Goodman and Townes Van Zandt to mention just a few" he continues. For Olav it doesnt stop there. Although he still listens to all the "old guys", he also finds inspiration in the likes of Ryan Adams, Bright Eyes, Richmond Fountain, Howe Gelb and many of the other talanted singer/songwriters of his own generation. 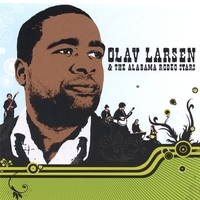 Olav Larsen and his band The Alabama Rodeo Stars got signed to the Rootsy.nu label in the spring of 2006. Rootsy.nu is an inependent record company specialising in roots oriented music. His first long player, with his backing band The Alabama Rodeo Stars, intituled "Loves come to Town", was released on the 21st of august 2006.